If you are an online seller struggling to increase revenue, you most likely have wondered where the majority of your visitors have gone. Many have either inquired but never purchased or filled their shopping carts but stopped at checkout. The bad news is, the world of virtual shopping is filled with cart-abandoning customers. They visit your page, browse items, inquire further, add them to their carts, and then change their minds and navigate away from your website without actually buying anything. That’s shopping cart abandonment every online store has to face. This is a common practice called shopping cart abandonment. Baymard Institute’s 2015 compilation of 31 different studies from among 15 major research companies reveals an average shopping cart abandonment rate of 68.53%. This can be a disheartening statistic, but here’s the good news: there are highly effective strategies to turn your shopping cart abandoning visitors into valued customers. To begin with, it is vital to know the underlying causes of shopping cart abandonment to find the Achilles’ heel of this curse. According to the above report by WorldPay, checkout-process related concerns are among the main causes of shopping cart abandonment. Therefore, streamlining your checkout process is the logical approach to reducing abandoned carts. Here’s a quick list of how to give the checkout process a facelift to drastically reduce shopping cart abandonment for your eCommerce website. 68% of online shoppers abandoned carts right before checkout, and most of the cases happen at cart page – where shoppers review their cart and decide to leave due to cost/pricing related issues. Right at the cart page, customers need to be presented with add-on incentives to move on to checkout. What would they most be interested in at this moment could be a discount code, a free shipping offer, or a free gift complementary to their bought item. This pop-up countdown offer is created by Checkout Boost app. 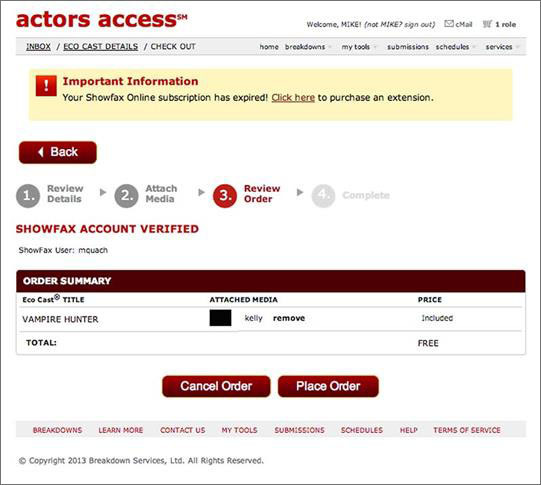 Besides countdown timer, it also allows checkout share on social media or exit-intent offers. 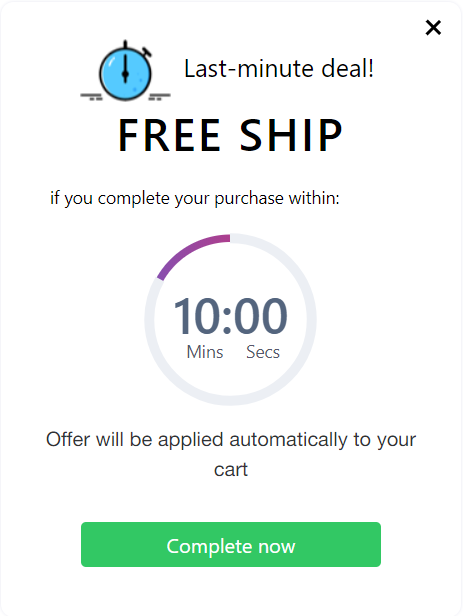 By adding a countdown timer to the offer, a sense of urgency is created to make customers more prompt to check out in order to get free shipping. 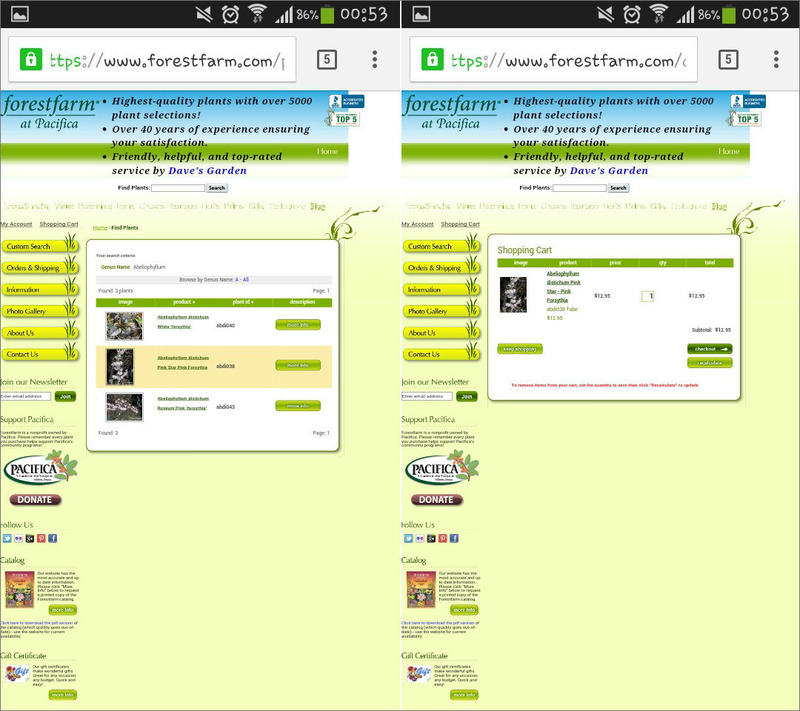 Here is an example of a checkout process to illustrate the hassles of tiny images on mobile-unfriendly online shops. Screenshots are taken on a Samsung Galaxy Core LTE. 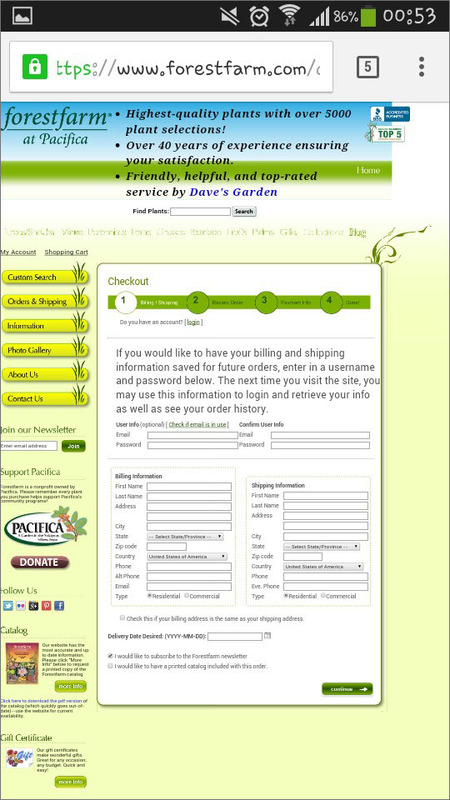 Say you are online shopping for plants. To begin with, you may most likely complain about how crowded and hard to read this site is. 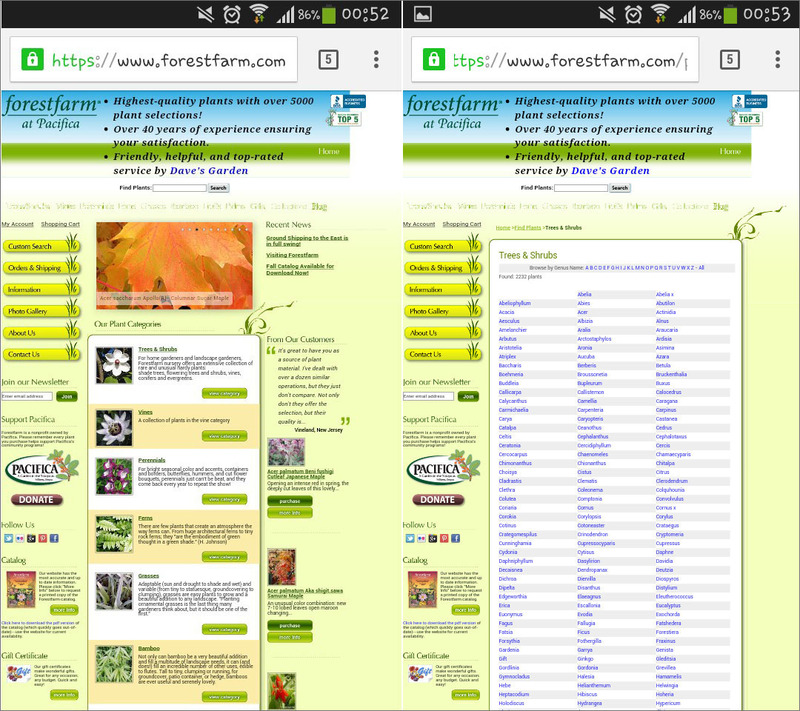 It may not be possible for you to view plant names and images clearly without zooming in, which would then require you to move your screen around to view the entire page. You select an item for more information. The text in the description is so small that reading it becomes a chore. You may have to zoom in again to view product information. These annoying font sizes mess up the checkout process. Also, it is glutted with questions and lists to fill up. I don’t know about you, but I, together with a staggering rate of annoyed online shoppers, would close that website, google another online plant store with a more user-friendly interface, and most likely end up with the next sample. Vivid images, clear shipping options, and large tappable buttons on your user-interface are marks of a reliable website. 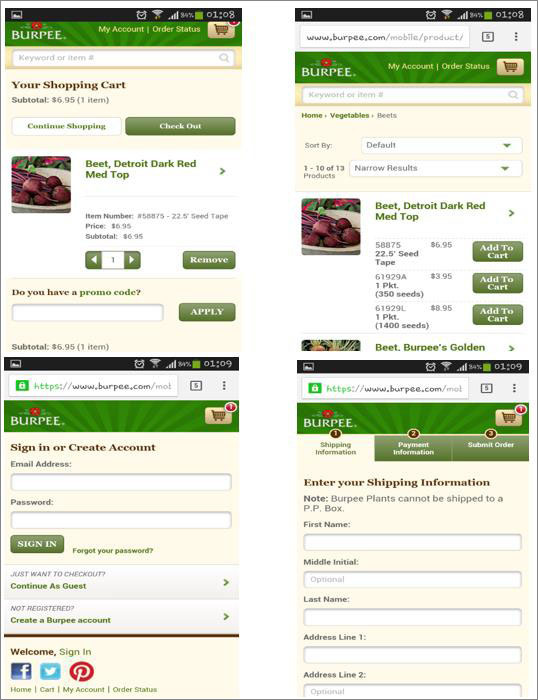 As these two samples show, streamlining the checkout experience for mobile users can vastly improve sales. For those just getting into selling products online, it is easy to take a more inquisitive approach when it comes to gathering customer information. After all, asking for more information from the user may give them a feeling of security. 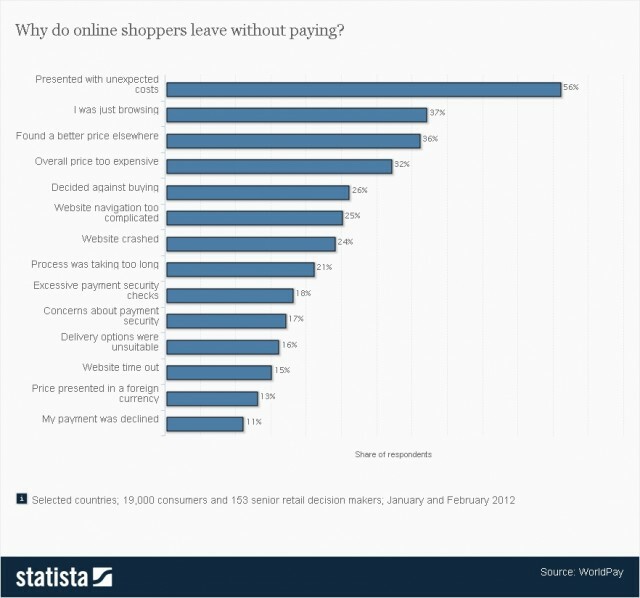 On the contrary, online shoppers tend to leave in the middle of a complicated checkout page. Some may feel that asking the users to key in a bunch of alternative contact details, in addition to their credit card number, security number, expiration date, full name, and address, will show their customers that they care about their security. The bottom line is that shoppers do not enjoy endlessly filling out forms. When was the last time you saw a long application form and said, “Oh boy! I love giving my phone number, 2 alternative addresses, mother’s maiden name, and life story to strangers on the internet!” Not to say security isn’t important, but there are ways to give your users a feeling of security without feeling like they’re standing in line at the embassy. Informing your customers about what page they are in the process is an important feature of your website. If the customer has no idea about how far he is in the process, there is a greater tendency of giving up in the middle of the checkout process thinking it’s going to be time-consuming. Giving your customers an idea of where they are in the process will make them think twice about abandoning their purchase. Allowing them to track their progress encourages them to complete the transaction. Not only is requiring a membership log-in a time-consuming procedure, but it also impels them to abandon your website out of the fear of receiving spam. Although some customers choose to apply for a membership later on to avail of benefits or specials, this is not always the case. Most of the time, like real-world shopping, customers start off as walk-in clients with no intention of subjecting their precious e-mail address to a plethora of spam messages and discount offers on products they don’t need. Make sure that a check-out option is readily available for your walk-in clients so you can reduce shopping cart abandonment rate. Customize your payment options to include the easiest methods for your customers. All major credit cards and online bank accounts such as Paypal are vital. A good number of debit card users may also be among your shoppers, so make their shopping experience as painless as possible. 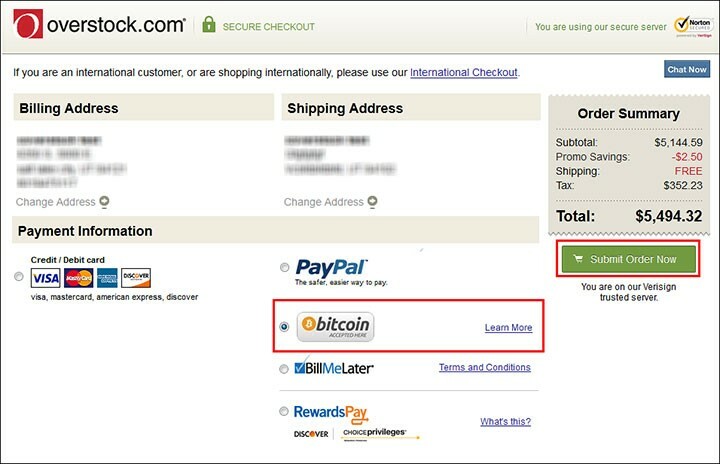 Other unconventional online payment methods like payments via bank outlets, or bitcoin, may also be widely acceptable depending on the location of your target demographic. Giving customers a variety of supported payment methods will greatly reduce shopping cart abandonment. Don’t lose customers because they don’t have a way to pay you. This is the most vital feature for every online retailer. Gaining your customers’ trust is much harder online. Start with taking steps to ensure the safety of your website from hackers. 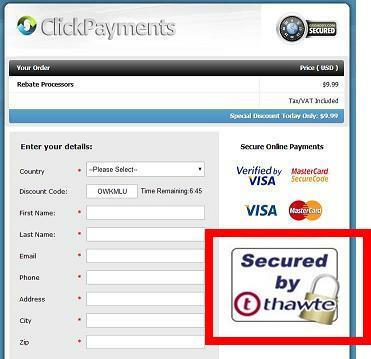 Inform them of the security measures you have taken to ensure that your online store is safe. This makes them feel more at ease in keying their credit card information. There are plenty of security methods to start with. Learn about internet certificate authorities like Thawte. Making that “padlock” sign visible indicates the importance you place on online security and protecting your customers from fraud. True, shopping cart abandonment is one of the most frustrating obstacles for online sellers. It is heart-breaking to see people leaving your website without buying anything. But do not let those numbers scare you. Just a few tweaks to your interface will help you convert shopping cart abandoning visitors greatly.